First cookies of the holiday season, originally uploaded by in2jazz. Preheat oven to 350º F. Grease cookie sheets or line with parchment paper. In a large bowl, cream together butter, sugars, and vanilla until light and fluffy. Add eggs one at a time, beating well with each addition. Combine flour, baking soda, and cinnamon; gradually stir into creamed mixture. Fold in rolled oats, cranberries, chocolate chips, and pecans. Drop rounded spoonfuls and press them by hand onto the prepared cookie sheets. Bake for 12 to 15 minutes in preheated oven. Remove cookies to a wire rack and cool completely. I have made these cookies for a few years now but I wanted them to be more chewy and soft. My secret baking angel suggested that I use 1/4 cup less flour and also finely chop the cranberries and pecans. Press the cookie dough flat by hand on the cookie sheet which makes them spread wider. I bake my cookies for 12 minutes then pull them out of the oven as they will keep cooking as they are cooling which makes them more chewy. § 2 Responses to Cranberry Oatmeal Chocolate Chip Cookies"
Yay! I love these cookies but they did have a tendency to be too crispy for my taste. I’ll be baking them over the weekend. I just made an amaretto cake in the style of your rum cake just now. It’s so good that I’ll probably just keep them and eat them myself! 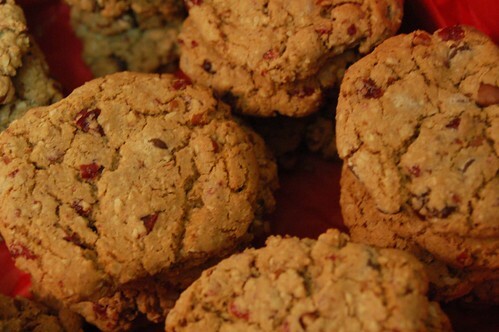 You are currently reading Cranberry Oatmeal Chocolate Chip Cookies at Simply J Life.